Austrian writer; born at Prague Nov. 7, 1848; studied law and, later, German philology at the universities of Vienna and Prague (Ph.D. 1870). In 1868 he became assistant editor of the "Tagesbote aus Böhmen," and in 1873 was made dramatic and art critic of the "Bohemia" at Prague, in which city he settled. In 1885 he became privat-docent in German literature at the German technical high school at Prague. In 1901 he removed to Charlottenburg, near Berlin. 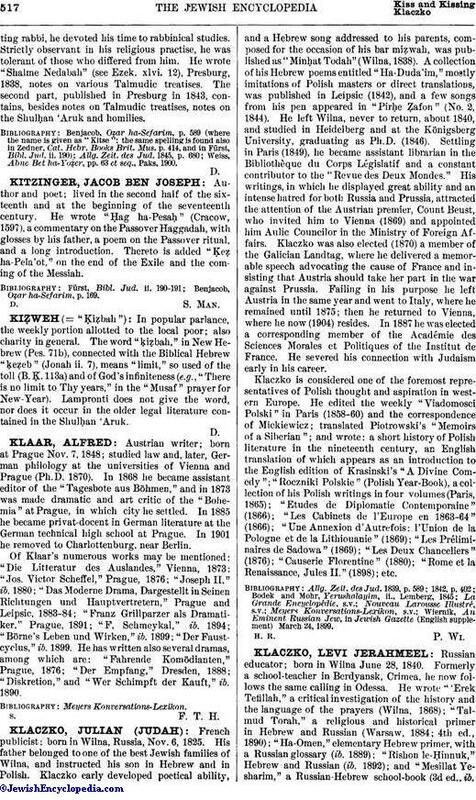 Of Klaar's numerous works may be mentioned: "Die Litteratur des Auslandes," Vienna, 1873; "Jos. Victor Scheffel," Prague, 1876; "Joseph II." ib. 1880; "Das Moderne Drama, Dargestellt in Seinen Richtungen und Hauptvertretern," Prague and Leipsic, 1883-84; "Franz Grillparzer als Dramatiker," Prague, 1891; "F. Schmeykal," ib. 1894; "Börne's Leben und Wirken," ib. 1899; "Der Faustcyclus," ib. 1899. He has written also several dramas, among which are: "Fahrende Komödianten," Prague, 1876; "Der Empfang," Dresden, 1888; "Diskretion," and "Wer Schimpft der Kauft," ib. 1890.